Going up early, since I don’t think I’ll have a chance to upload tomorrow. I’ll resume the saga of the office redesign next week, hopefully, but for now, I just wanted to share what I did today. I have a whole Pinterest board for my office/craft room ideas. I was very intrigued by the photos of filing cabinets transformed by modge-podge and paper or fabric. 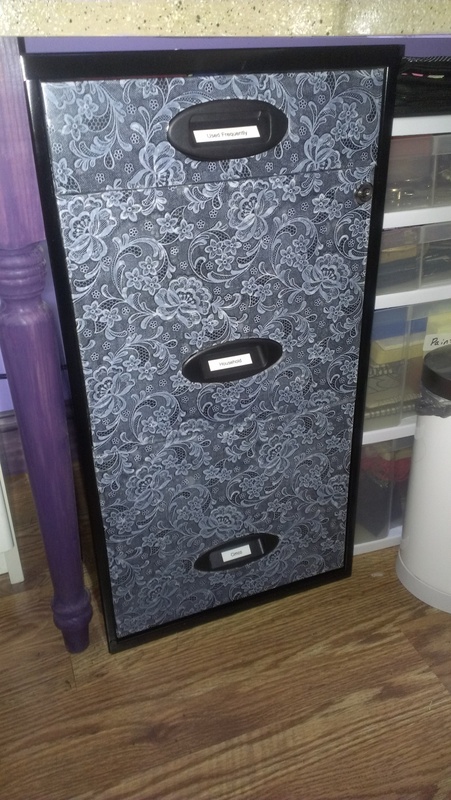 Only problem: I didn’t have fabric that I wanted to use on file cabinets, and my plan of using scrapbook paper failed when I realized a standard size sheet of scrapbook paper isn’t big enough to cover an entire file cabinet drawer. I LOVE IT! Can’t wait to do the others! I’m now wishing I’d thought of this idea BEFORE I bought black filing cabinets, because I’d love to see something like this in my office. Oh well, I’m quite happy with how things turned out!